I am passionate about starting the day right with a good hearty breakfast. If you have been to one of my Better Breakfast workshops you will know that porridge, and the many variations that I experiment with, is a favourite. Here is my latest recipe, perfect for chilly Winter mornings. Directions: Soak your oats in the water from a can of coconut milk (put the solid part in a bowl, cover and refridgerate). Whilst the oats start to absorb the fluid and soften crush the seeds of two cardamom pods in a pestle and mortar, add these to the oat mix with a teaspoon of ground turmeric. Heat gently, adding filtered water to keep the porridge loose. When the oats have absorbed the fluid add a date broken up in little pieces, the zest of half a lemon and a tablespoon of the coconut cream - you can then set to one side. Leave to cool slightly whilst you toast a handful of pistachios in a non stick frying pan with a teaspoon of coconut sugar. The sugar will instantly melt and stick to the nuts and not the pan! Serve into two bowls adding the nuts, linseed and fruit. This porridge is the most decadent, fragrant and perfectly delicious breakfast bowl!! I hope you enjoy it as much as I do. Benefits: Oats will fill you up till lunch, mop up excess blood fats and keep blood sugar stable. Cardamon calms the digestive system whilst turmeric acts as an anti-inflammatory throughout the body. 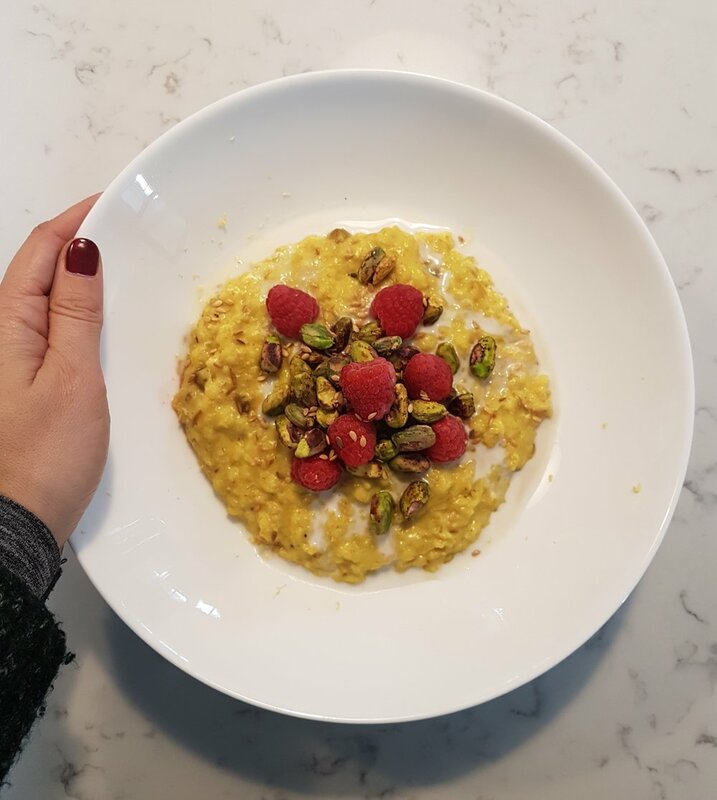 This porridge recipe is refined sugar, diary and gluten free, plus it's suitable for vegans.